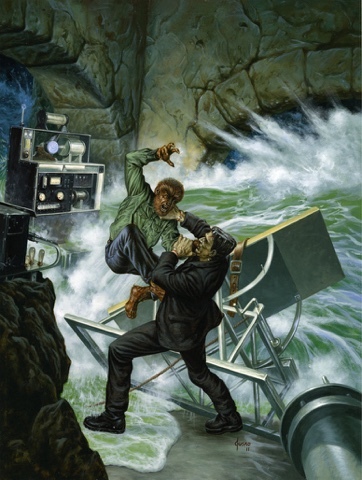 Frankenstein’s original monster and Larry Talbot as the Wolfman are coming out of retirement to go head to head in mortal combat again. The first time the two powerhouses met, the Wolfman did the Monster in only moments before someone from an angry mob dynamited the fight venue, causing the entire place fall in on their heads. But the two are back to settle matters. The Monster had no words. He’s still in the process of being rebuilt. Sources said he’s getting parts from boxers who perished with the fight still in them, legendary wrestlers from 100 years ago and M4 Sherman tanks that saw action in WWII. The match-up will take place during the fall at a time and date to be announced soon. Fight organizers are pushing to get Madison Scare Garden to host the bout. JLP is your portal to the monster community, offering a wide variety of stories, news and the always-fun obituaries about Transylveinya's citizens. The monster revolution is upon us. MONSTER UP! Be sure to check us out on Facebook (Jack O. Lantern) and on Twitter (@JackOLPress). We're also on Instagram (JackOLanternPress) and Pinterest (Pinterest.com/MrJackLantern). MANAGEMENT: Michael Picarella (Publisher/Content Manager/Writer), Tom Picarella (Head of Research and Development) & Robert Picarella (Marketing Director). R . I . P .